Originally released in 2010, Janelle Monáe’s debut album The ArchAndroid was the follow up to the 2007 EP Metropolis Suite I: The Chase. With its innovative sci-fi concept, eclectic musical production, and its symbolic alter-ego Cindi Mayweather, this album is a trendsetter that bridges different eras and art forms to tell an empowering and compelling story. The ArchAndroid continues the story of android no. 57821 Cindi Mayweather, who is on the run from Droid Control for falling in love with a human named Anthony Greendown. Cindi lives in a futuristic dystopian city known as Metropolis, where androids are discriminated by humans. In this album, Cindi discovers that she is a messianic figure known as The Arch Android, meant to travel through time and rebel against oppression. When it comes to the music production, it features a broad range of genres and influences. Due to its otherworldly concept, the entire album sounds like a Broadway show recorded in the studio. With each track, the album shifts seamlessly from classical, funk, rock, jazz, and more. There are even some perfect transitions between songs, such as the changeover from “Dance or Die” to “Faster”. Within a whopping 18 tracks, there are quite a few standouts. “Locked Inside” evokes Michael Jackson’s Off The Wall album with its beat as its lyrics feature Cindi singing about the dangerous world she lives in, her resolve to change it, and her need for Anthony Greendown’s support. “Cold War” addresses the listener to “know what they are fighting for” with a groovy drum beat and an electrifying guitar solo. Other standout tracks include “Mushrooms and Roses”, “Say You’ll Go”, and “Bopbyeya”. “Mushrooms and Roses” is a psychedelic rock track whose lyrics bring to mind gay bars and sensuality. “Say You’ll Go” has a quiet storm R&B vibe with a dash of classical music and gorgeous lyrics that have Cindi encouraging Anthony Greendown to follow her where she goes. Finally, the album’s closing track is a big jazz number with soaring vocals that bring to mind Ella Fitzgerald or Lena Horne. By the end of the album, you get the sense that the android Cindi Mayweather is meant to represent The Other, especially the Black community and the LGBTQ community. As a Black queer person, Cindi Mayweather gives me an image of being resilient and celebratory despite facing persecution for who she is. These themes would carry over to Janelle Monáe’s 2013 follow up album The Electric Lady and the 2018 album Dirty Computer. Although Dirty Computer focuses on Janelle Monáe and not Cindi Mayweather, the sci-fi influences seen in The Archandroid are still there. The emotion picture accompanying the album focuses on a young Black woman named Jane 57821. Labeled a “dirty computer” and undergoing a cleansing at a facility called The New Dawn, she struggles to hold on to her memories of who she is and her lovers Mary Apple and Ché. In fact, Jane 57821 feels like Cindi Mayweather’s ancestor. She is a Black queer woman in danger of having her humanity stripped from her much like the Black community and the Black queer community is right now. While this is just personal interpretation, there is no denying how relevant it is. 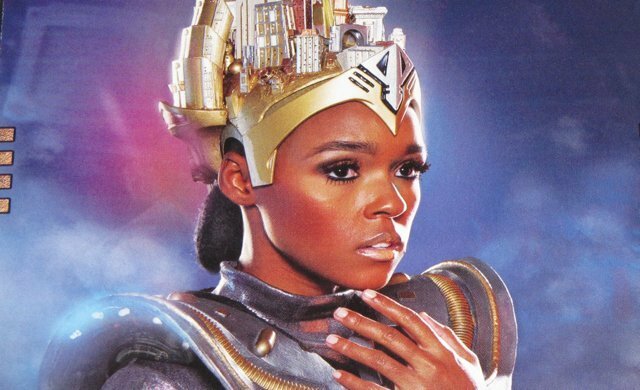 Monáe states she had the idea for Dirty Computer prior to developing The Archandroid album, but both albums sound timeless. With The Archandroid, Janelle Monáe brought the past and the future into the present. It is a masterpiece that combines Broadway flair, classic sci-fi, and various music genres to be a new voice for the marginalized and the misfit. It is Blacktastic, fantastic, and a pleasure for the ear and the mind. Listen to it and let Janelle Monáe and Cindi Mayweather set you free. Latonya Pennington is a freelance writer from the southern United States specializing in entertainment and pop culture. In addition to BlackSci-Fi.com, her pop culture work can be found on The Mary Sue, Black Girl Nerds, and Buzzfeed. When she isn’t freelancing, she can be found tweeting, reading, doing creative writing, or streaming music, shows and anime online. Find her on Twitter.